Below is the full report from director Boachie Danquah of the conference held in Kumasi on January 12, 2013. This is to let you know what God is doing in Kumasi. Dora and I got there on the 9th of January 2013 to be part of Rev. Isaac Osei-Bonsu’s monthly conference on the 12th as well as the orientation classes (14th Jan.) and holding classes with the students of the second branch of the school there. Rev. Osei-Bonsu and his Associate Pastor, Rev. Addai-Kwateng are the facilitators of the school. Rev. Osei-Bonsu is a graduate of the school. The conference was well attended. He hired 25,000 chairs but people were still sitting on the ground as well as standing in the hot sun. I can therefore confidently say that over 30,000 people were in attendance. 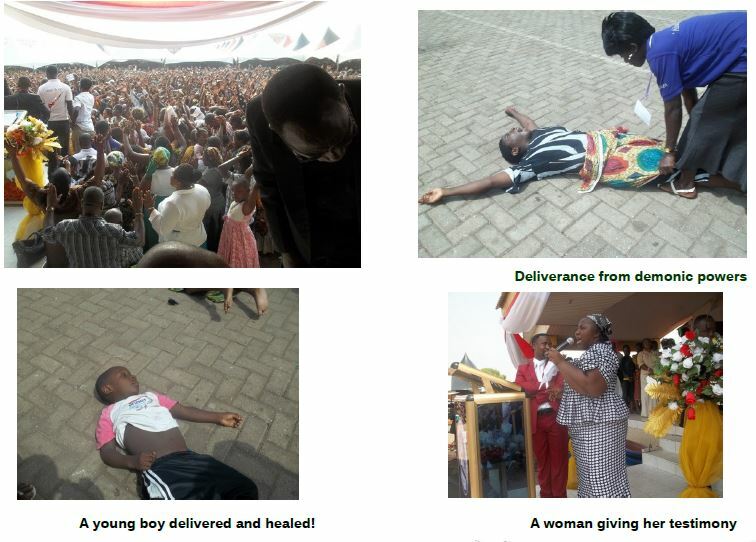 There were a lot of healings and deliverance from demonic powers and can all be seen in the attached photos and the video which will be sent to you later. So many people were healed from epileptics while others were delivered from stroke, etc. We went to Obuasi on Sunday where our facilitator was blessing his marriage (marriage renewal). We left there at 12.30 p.m. for the orientation classes in Kumasi which was also well attended. 122 students had registered as on the closing date, the previous Friday. I explained to them the content of the course, its purpose and how it was going to be run. It was very exciting and very welcome. They were divided into 2 classes, those for the evening classes (Tuesdays & Thursdays from 6.00 p.m. to 9.00 p.m.) and the weekend classes on Saturdays from 8.00 a.m. to 3.00 p.m. with one hour break. The number on the roll on Tuesday and Thursday were 50 and 52 respectively while that on Saturday was 57. The lessons went well with them and trust God for more students during the next class which comes on in June/July 2013. Upon the request of the facilitators and students, we are having classes with them for another one week and will get back to Accra next week.